Easy answer—yes, mostly. Let me explain. The upgrade improvements in the CR1000X are not simply cosmetic. The CR1000X is a completely new product from the ground up. However, because the programming and functions are very similar between the CR1000X and CR1000, the replacement is fairly straightforward. In the following sections, I’ll highlight the similarities and differences of the two data loggers that you should know about. Physically, replacing a CR1000 with a CR1000X is simple. The size of the CR1000X is the same as the CR1000. Here is where things get different. 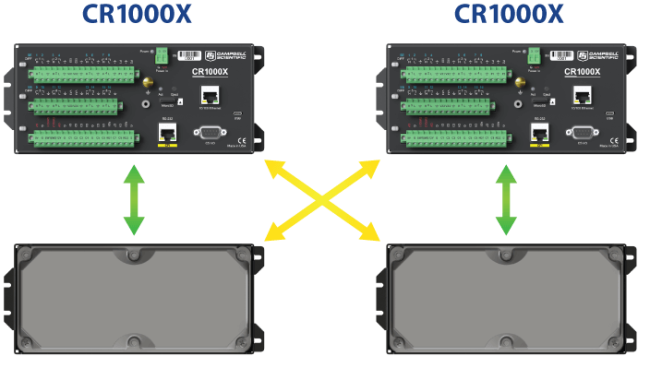 Removable terminal strips on the CR1000X wiring panel provide a quick and effective way to quickly swap data loggers without removing sensor wires or the entire wiring panel. The complete wiring panel and data logger are still separate components. 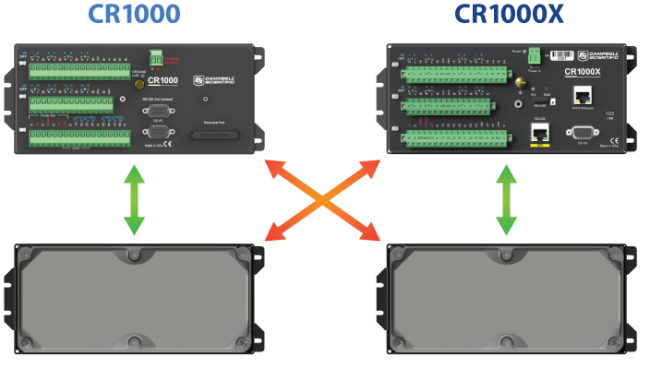 Like the CR1000, the CR1000X is in a sealed, protective enclosure, shielded from direct electrical damage through the terminal and port connectors. The wiring panel becomes the first line of protection for the data logger. This increases the probability that the data is saved if catastrophic damage should occur. And in most cases, the repairs are limited to the wiring panel. The CR1000X wiring panel is not generally intended to be interchanged with another CR1000X wiring panel. 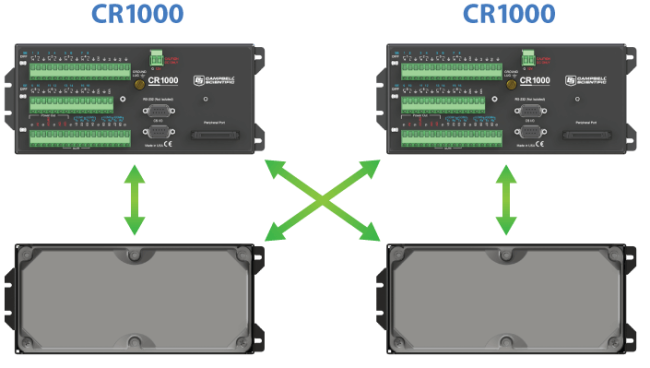 Because the CR1000X can measure analog current directly (0 to 20 mA or 4 to 20 mA), the wiring panel is not designed to be interchangeable. 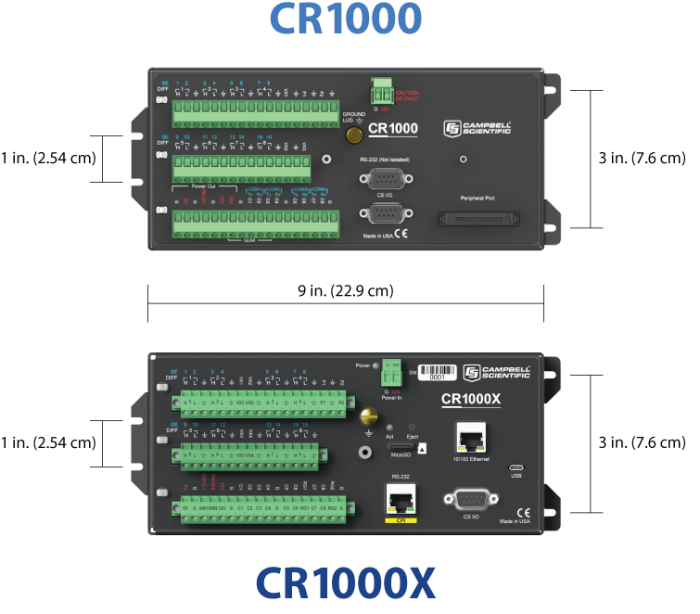 If the wiring panel of the CR1000X becomes damaged and a new wiring panel is required, the CR1000X wiring panel must be calibrated with the CR1000X measurement module to maintain current-measurement accuracy. The CR1000 wiring panel can be interchanged with another CR1000 wiring panel. For the CR1000, any wiring panel can be used with any CR1000 datalogger. The CR1000X and CR1000 wiring panels cannot be interchanged. The CR1000X wiring panel cannot be used with a CR1000 measurement module. The CR1000X measurement module cannot be used with a CR1000 wiring panel. Although there are significant additions to the CR1000X program instructions that are not available in the CR1000, in most cases you can load your program written for the CR1000 into a CR1000X with minor instruction changes. The most notable of these changes is in the analog measurement instructions. I will use the Differential Measurement, VoltDiff(), to illustrate. Dest The Dest parameter is a variable in which to store the results of the measurement. Same as the CR1000. Reps The Reps parameter is the number of times the measurement should be made. Measurements are made on consecutive channels. If the Reps parameter is greater than 1, the Dest parameter must be a variable array. Same as the CR1000. autorange Uses the most suitable range. mV2500C ±2500 mV; checks for open input. mV250C ±250 mV; checks for open input. mV25C ±25 mV; checks for open input. mV7_5C ±7.5 mV; checks for open input. mV2_5C ±2.5 mV; checks for open input. autorangeC Uses the most suitable range; checks for open input. mV5000C ±5000 mV; checks for open input. mV1000C ±1000 mV; checks for open input. mV200C ±200 mV; checks for open input. autorangeC Autorange; checks for open input. DiffChan The DiffChan parameter is the number of the differential channel on which to make the first measurement. If the Reps parameter is greater than 1, the additional measurements will be made on sequential channels. Same as the CR1000. RevDiff A constant is entered for the RevDiff parameter to determine whether the inputs are reversed and a second measurement made. This function removes any voltage offset errors due to the data logger measurement circuitry, including operational input voltage errors. False (or 0) = Do not make a second measurement. True (or 1) = Reverse inputs and make a second measurement. SettlingTime The SettlingTime parameter is the amount of time to delay after setting up a measurement and before making the measurement. Same as the CR1000. Performs a 250 μs integration. Performs a 16.667 ms integration; filters 60 Hz noise. _50Hz Performs a 20 ms integration; filters 50 Hz noise. Performs a 0.0667 ms integration. _50Hz (or 50) Performs a 20 ms integration; filters 50 Hz noise. Mult, Offset Both the Mult and Offset parameters are a constant, variable, array, or expression by which to scale the results of the measurement. With a multiplier (mult) of 1 and an offset of 0, the output is in millivolts. Same as the CR1000. Recommended for You: For programming assistance, watch the "CRBasic | Help System" video. There are two quick ways I use to convert a CR1000 program to a CR1000X program. Rename the CR1000 program file name extension to .CR1X. For example, if your CR1000 program file is Temp.CR1, rename it to Temp.CR1X. After this file is renamed, open it with the CRBasic Editor. Open the CR1000 program file in the CRBasic Editor, and copy all the instructions in the program. Create a new program for the CR1000X in the CRBasic Editor. Delete all the lines of instruction in the program, and copy all the lines of instruction from the CR1000 program. Replacing your current CR1000 dataloggers with our new CR1000X dataloggers should be a fairly straightforward process, and I hope the information in this article is helpful to you. If you have any questions I didn’t address, please post them below. Thanks for asking, Ekpyro. Be sure to specify COMC3 for the port. Using this will work just like it did for the CR1000. In getting my first CR1000X program to compile, after using CR1000 for some time, I see there are a few differences, including 'Com1' changing to 'ComC1' as mentioned above. Another difference seems to be that control port references, e.g. in the portSet() instruction, use 'C3' vs '3' for the CR1000. I don't see any mention of this in the pdf manual. Is a resource describing programming details available for the CR1000X? You are correct, other than what is mentioned in the blog, there is not a resourece available that describes the programming in detail. The PulseCount instruction was also changed and is not backward compatible. Specifically, the PConfig option uses different values than the CR1000. It would be helpful if you would provide a document that simply lists all the instructions that have changed, especially those that are not backward compatible. It wouldn't even need details about the change, as we can figure that out from the CRBasic Editor help system. Thanks! Great suggestion. I will make sure we post the list.